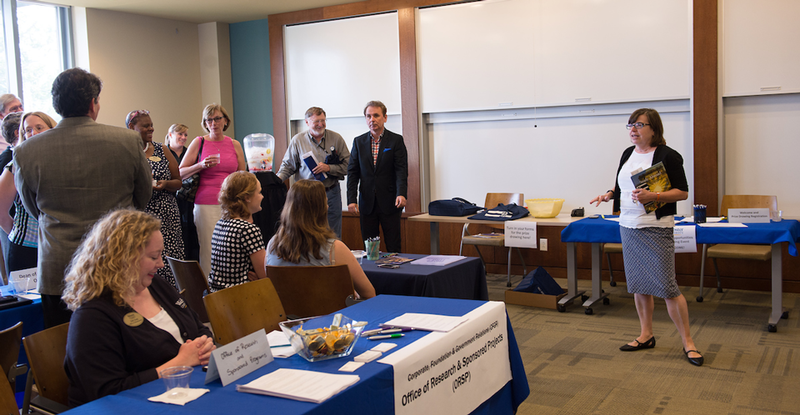 Faculty members joined representatives from over 20 Webster offices at the Webster Opportunities Networking Event on Sept. 15 in the East Academic Building. The Faculty Development Center presented this event as an opportunity to become familiar with campus opportunities and learn about new developments. Representatives from academic and student affairs and administration met and mingled with attending faculty members. Vice Provost Nancy Hellerud and Provost Julian Schuster welcomed attending faculty to the event. For more information, contact Liza Dister, Faculty Development Coordinator, at edister17@webster.edu.